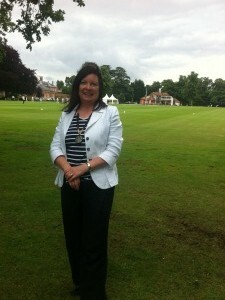 Last Saturday, 23rd June, I travelled to Wellington College (new territory for me!) to speak at the annual Sunday Times Education Festival- and luckily managed to avoid the controversy… As regular readers of my blog will know, I am deeply involved with education issues, chairing the All Party Universities Group and having a background in the education sector, so I was extremely pleased to have been invited to this prestigious event. The festival was huge, with hundreds of different events. My stream was all about further education, something which I think is vitally important in helping people to get the sort of job they would like, whether through an apprenticeship or work based learning, and no matter what their age. 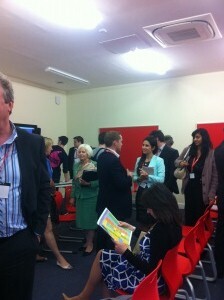 My session was entitled ‘You’re hired! Creating a skilled workforce for the 21st century’: I’m not sure whether the Apprentice reference was intentional or not! I was incredibly impressed with the buildings and grounds in Wellington College- it was like seeing how the other half live! I arrived just before two o’clock and was shown to the room where our session would be taking place. Other speakers in my event included Eugene Incerti, Head of Apprenticeship, International Skills Development Team at National Apprenticeship Service and Pauling Odulinski, Principal of Aylesbury College. I spoke about the need for the skills which further education teaches to clearly link in to the skills which are wanted by employers- after all, a major purpose of further education is to make people more employable in the sectors they want to enter. Further education has a vital role to play in social mobility. It is especially important at the moment with so many jobs being cut from the public sector by the Government, as many over 24 year olds are looking at ways to gain new skills and get back into employment. Over 24 year olds now have to take out a loan for level 3 qualifications, which particularly affects women and those on low incomes. The problem is worsened because of the high number of the workforce in places like Durham who are or were employed in the public sector, and the lack of Regional Development Agencies (since the Tory/ Lib-Dem government abolished them in 2010) because now there is no clear strategy for skills and growth in particular areas. The panellists and audience members were mixed, with members of teaching organisations, staffing bodies and even students themselves present to listen to and debate ideas about the role and future of further education. I could tell there were quite a few teachers present, with a big cheer being made when I said that teachers need more support with the Government’s proposed changes to further education funding potentially threatening their future employment. After the session, and a chat and coffee with people who attended, I went for a brief walk around the grounds of Wellington College. Luckily the rain held off for long enough for me to admire the site and appreciate the peace, before heading back to Durham. As we all know weather wise it has been very damp (well, ok, extremely wet) in Durham these past weeks. 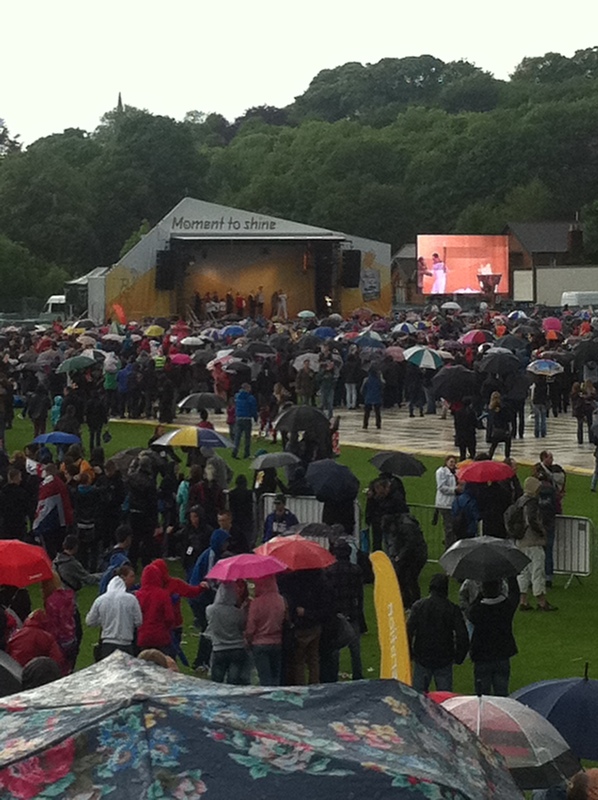 But not even the inclement weather was enough to dampen spirits as the Olympic torch arrived in Durham on Saturday evening for an overnight stay. Walking to the race course on Saturday I could feel a real sense of excitement in Durham city centre. Crowds were gathering along the path of the torch leading through the city centre and down to the race course, all wanting to see the flame on its visit to Durham. As it passed by everyone cheered the flame on by waving flags (or what I now know are called twizzel sticks) and cheering with excitement. When I arrived at the race course there were about 20,000 other people who had also made the trip, despite the rain, to join in the celebrations and greet the flame. This was carried in by Matt Baker, star of Countrywide, the One Show and Strictly Come Dancing etc, who is himself a Durham man. Another highlight for me was seeing huge cauldron being lit on the stage, an absolutely amazing sight even for those people standing at the back of the huge crowd with brollies in the way! 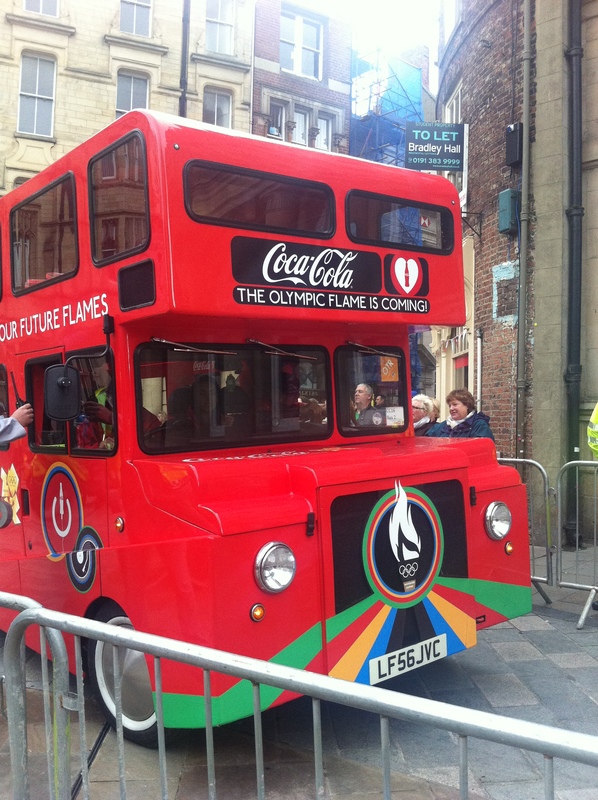 Durham County Council and the Olympic organisers did a great job organising the event. Local schools and choirs sung beautifully and the display at the end from local gymnasts was simply breath taking. Everyone I spoke to thought it was a marvellous occasion despite the rain. 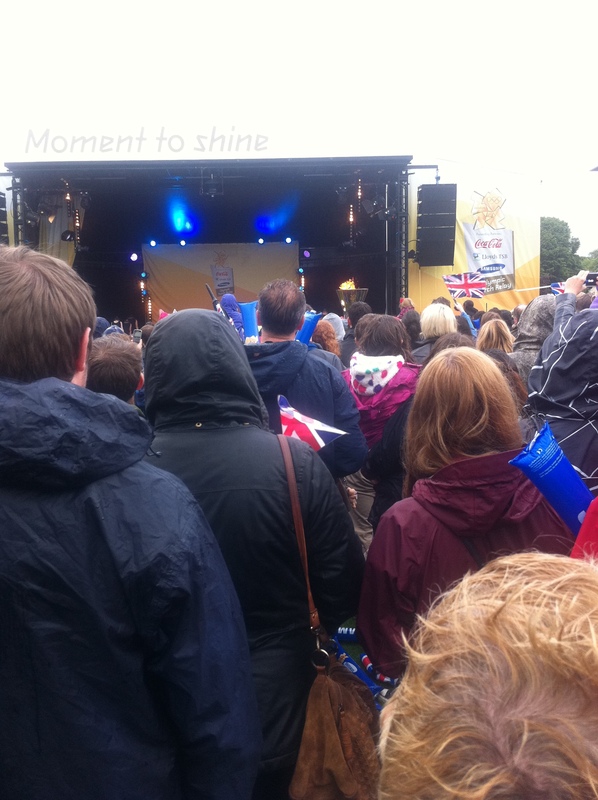 I also think it’s fantastic the number of Durham residents who braved the rain for the once in a life time opportunity to see the Olympic torch- it really made me proud of our fantastic city. After just about managing to dry off by Sunday morning, I headed out again to enjoy the second day’s events. 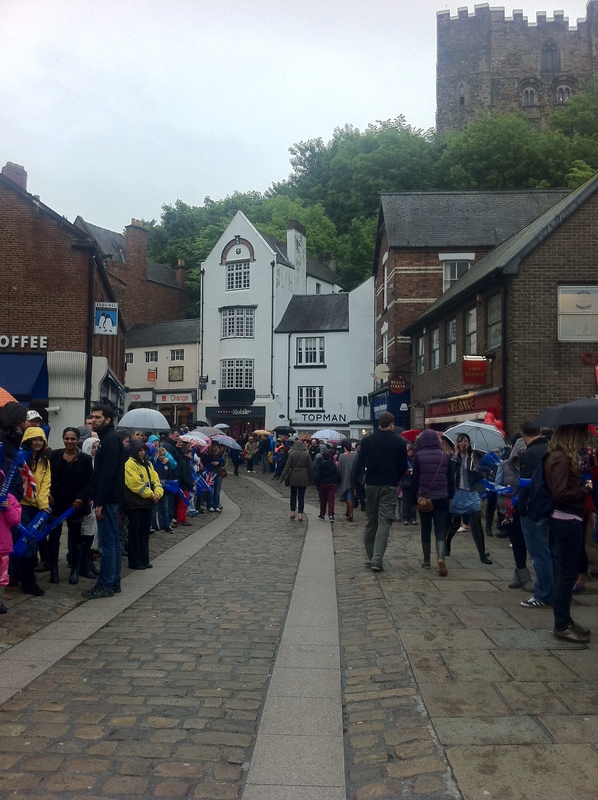 The torch began its exit from Durham at the Cathedral. I gather from twitter that the Dean got to hold the torch in front of the Cathedral- must have been a fantastic sight for anyone who caught it. Meanwhile I was waiting patiently down with hundreds of others in the Market Place for the torch to make its way down Saddler Street. I was even given my own green twizzle stick to wave. The weather was better on Sunday so there was loads of good cheer from the enthusiastic crowd! At last Paul Collingwood MBE, former Durham and England cricketer, arrived with the torch to the sound of huge cheers from the onlookers. 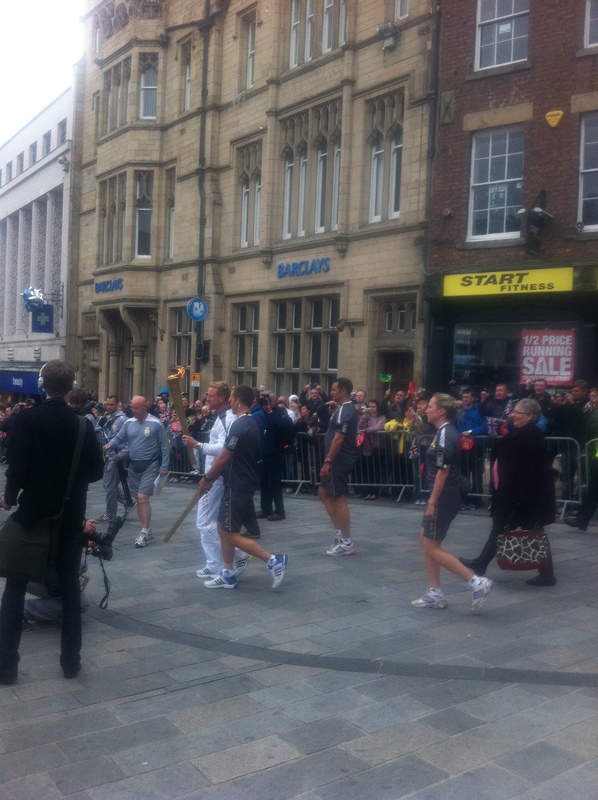 All in all, the two day event seemed to cheer people up immensely and the view from the crowd was that Durham had done the torch very proud and vice versa! For now, it’s back to reality but I think the excitement about the Olympics themselves has definitely arrived, both in Durham and across the nation. Whether you share my excitement or have other opinions, I would love to hear your views!